A three days journey though the Forest Wilderness brought the brave duo back to the safety of Castle Drachen. Danaeryzard and Alaria settled back into their room at the Barracks and tried to get some R&R before being summoned to their next mission. However, it wasn’t long before a messenger delivered word that Esmeralda was waiting to speak with them in the Great Hall. The Great Hall is a giant room filled with tables used for meeting and eating. Cauldrons were cooking up stews and kegs of mead were found stacked around the room. Dany and Alaria made their way through the room to where Esmeralda was seated. At the table with her was an Elf that they had never seen before. They cautiously approached until Esmeralda indicated to them to come and sit. “Greetings Alaria, Danaeryzard. Please join us. This is Hedwig, a Druid Elf visiting the castle on official business. 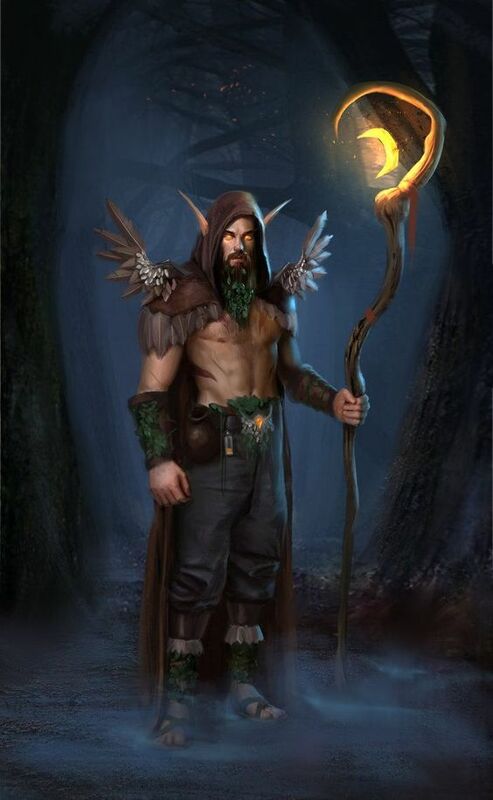 I thought he could spend some time training the both of you on Druid fighting techniques and battle strategies for forest combat,” Esmeralda said, standing to greet the newcomers. Hedwig did the same and they all shook hands before sitting down at the table together. “Certainly, I’d be delighted to go over some of my proven tactics,” Hedwig replied, feeling a little awkward. He was a strong, middle aged Elf with several decades of combat under his belt, but he never thought of himself as one to train the new recruits. His battles were often improvised – not necessarily planned and prepared for carefully in advance, contrary to how he’d have Esmeralda believe. Dany and Alaria glanced nervously at each other. They didn’t even come close to completing the mission. In fact, they felt somewhat responsible for the deaths of some innocent townspeople at Lake Constant, and felt extremely forlorn about the whole mission. They weren’t any closer to discovering the mysteries of the crystals, or finding the location of the Sun Wizard. However, they recapped their travels, explaining about the magical abilities the the Golden Dragonborn have been using to change their form, as well as their encounter with the Hag and the crystal stones they found in the foundation of the library. Esmeralda did not hide the concerned look on her face when she heard about the crystal stones. The fact that the crystals, in massive form, were embedded into the very foundation of the building itself was grave news indeed. She asked to see the building schematics that they had collected from their defeated enemies. Esmeralda surmised that the crystal stonework creates an immense power. She sent the schematics to the Drachen Scholars to analyze and decipher. When they stepped into the Garden Courtyard, Dany and Alaria were amazed. Courtyard was an understatement! The Drachen Gardens were so vast, it could have been called a forest. Acres and acres of green grass, lush trees and foliage, and meticulously organized flowerbeds were spread out before them. Hedwig and Esmeralda led the way to an open grassy field, speckled with a few giant trees. They were discussing how this area would be more suitable for combat trials, with less obstacles and no flowerbeds to trample. As they began to get set up, suddenly an ear-splitting alarm began to ring throughout the entire castle grounds. Esmeralda’s face went pale. “Oh no. Bug Bears again!” Hurriedly, Esmeralda packed up some weapons and put them in her own sack, obviously preparing to go to battle. “I have to go take care of this. I’m going to give you each a set a Chat Rings, so that we can communicate. If you both wear the ring and earring, you can communicate telepathically with anyone else wearing the set.” She quickly showed them how the Chat Rings worked and then rushed off towards the entrance of the castle. Unsure of what to do, Dany and Alaria remained in the courtyard with Hedwig. After about a half an hour, the alarm was still going off and Esmeralda had not returned. The three decided to search around the area, maybe they could help somehow. Dany looked around by the trees surrounding the clearing. As she turned to search deeper into the wooded area, she heard the sound of branches being stepped on by something heavy. Something that was breathing loudly. Something… growling! She turned to her left and saw that a giant Bug Bear was heading straight for her. It was at least eight feet tall and fierce, but it did look as though it had already been in a serious fight. The Bug Bear roared and charged towards Dany, Alaria and Hedwig. In a panic, Alaria tried to contact Esmeralda with the Chat Rings, but heard no response. They were on their own! Taking the lead, Hedwig raised his crossbow and took a shot directly at the Bug Bear, which stopped it in it’s tracks. But the Bug Bear was not severely injured from the arrow; it pulled the bolt from it’s shoulder and roared once more. Seeing an opening, Alaria whipped out her wand and cast her new favorite spell: Hideous Laughter at the Bug Bear. The targeted beast took a step forward, tripped, and fell flat on it’s face, erupting with a wailing laughter that was louder than the intruder alarms still blaring through the castle. Hearing these cries attracted another Bug Bear to the trio, this one approaching from the south. Dany knew that they might be overwhelmed fighting both of these strong Bug Bears at once. Since the first Bug Bear was doubled over in fits of laughter, it was incapacitated, but not getting hurt either. Gripping her crystal orb, Dany tried a new spell, the Cloud of Daggers. She cast this cloud at the laughing Bug Bear. Since it was already unable to move because of the Hideous Laughter, it would be stuck within Dany’s Cloud of Daggers, which was a thick cloud filled with spinning daggers that slice at anyone in the cloud. The synergy of the spells cast by Dany and Alaria would take care of the first Bug Bear, while they focused on the second attacker! Were these partners finally starting to learn how to battle effectively?? The second Bug Bear was headed straight for Hedwig. It began to swing a giant, spiked mace and roared wildly, but Hedwig used his spritely reflexes to dodge at the last moment. Alaria and Dany both shot at the second Bug Bear with crossbows, while the first Bug Bear remained in the cloud of laughter and daggers, which was beginning to turn red with blood. Whimpers could be heard between the roars of insane laughter. Hedwig recalled some of his woodland creature studies and realized that while Bug Bears have a high armor class, their HP isn’t very impressive. But they are chaotic and will always attack! The second Bug Bear was proving to be quite chaotic as it swung it’s mace at Dany, hitting her with a heavy blow to the arm. She took a step back, reeling from the hit. It was at that moment when the first Bug Bear’s laughter turned into a weak howl… and then silence. The cloud attack had worked decisively. Now, to finish off the second Bug Bear. Hedwig swung his axe at the Bug Bear, but it missed and hit Dany instead! Her dragonscale arm was bruised and bleeding. Alaria’s crossbow attack missed the erratic Bug Bear, who dealt another blow to Dany with the heavy mace. Now Dany was getting mad – why was she the main target here?? She channeled her anger through her crystal orb to release a Fire Bolt cantrip directly in the Bug Bear’s hairy face. It roared in pain and beat down the flames on it’s fur. Hedwig took a few steps backward and made a wide sweeping motion with his staff to cast a Thunder Wave spell. The wave of energy charged directly at the Bug Bear, tossing it through the air and slamming it against one of the giant trees in the Courtyard. The Bug Bear was stunned and stood still, giving Alaria a perfect shot for her crossbow. She hit the Bug Bear in it’s chest and it howled in pain. Dany cast another Fire Bolt, but a moment too late. The Bug Bear jolted out of the way and the giant tree behind it was set ablaze. As it ran, the Bug Bear hurled it’s mace at Alaria, hitting her strongly on her side. Hedwig brandished his staff once more, summoning the power of the Moonbeam spell. Beams of light and rays of stars engulfed the Bug Bear with ghostly flames and it’s body fell in a crumpled heap on the grassy grounds. The trio stood, panting, and surveyed the area to make sure no more attacking Bug Bears were headed their way. All was quiet. “Why didn’t Esmeralda respond to our distress call?” Alaria wondered aloud. A moment later, Esmeralda and a group of soldiers stormed through the Courtyard, only to stop and see the carnage. Esmeralda looked surprised and impressed to see two dead Bug Bears laying in the field. She asked Hedwig to analyze the skills of Alaria and Dany. “I like how they used the forest to their… advantage…” Hedwig said, glancing over at the giant tree that was still burning a few yards off in the distance.